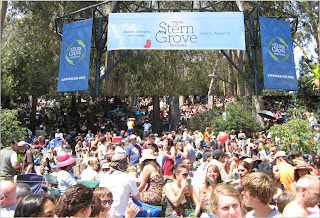 After lounging around all morning, Jessie and I made our way to the Stern Grove Music Festival that takes place every Sunday afternoon during the summer. We got there after it had already started, so it took a while for us to find a spot to sit. The music was pretty good, it was just so incredibly hot and crowded that after drinking some wine and eating some yummy snacks we decided to head out. But we’ll definitely be back this summer when Kevin’s here and we get there earlier! The hoards of people enjoying the sunny day in SF! Me and Jess loving the sunshine! "She works hard for the money…"
The building where my office is, Alliant Int’l University has half of the 1st floor and all of the 2nd floor, there’s an art university and another company that shares the building. Good ol’ Pier 39, directly across the street from my office (it’s still exciting to me…I’m afraid all the tourists might get old pretty quick though! I’ve pretty much just jumped right into work, they’ve put me to work pretty quick so I’ve been really busy my first three days there! What we’re working on heavily right now is going through all 4 years worth of credential student’s files and streamlining them into one clear format. So it’s basically paper shuffling right now 🙁 but this process is going to make my life a lot easier in the future! It’s an in-law unit (basically the basement of someone’s house that’s been made into an apartment) that has one bedroom, a full kitchen, living/dining room, full bathroom, and a yard…and the absolute best thing about it…we can have a dog!! We’re going to wait to get our new bundle of joy until Kevin gets a part-time job, but I’ll definitely keep you in the loop. The neighborhood it’s in is the Portola District in southeast SF. It’s not the prime location, I’ll be honest, but the more I read about it and drive around the more I feel like it might be the perfect location for us to get our feet wet in SF. Here are some photos of the new place! put a table/chairs out for get-togethers! I left at 6:30am this morning and having never made the drive up north on my own, luckily it was a lot better than I was expecting! A little traffic here and there, but it was mostly smooth sailing until the Bay Bridge. Feeling much more awake after a little Starbucks/Pleasant Valley State Prison, anyone? I got into the city around 1:30pm and met Jessie and her boyfriend Kindrid at Dolores Park. Kevin and I have been really busy these past two weeks packing, packing, packing! Because I’m not going to be there in the apartment the last two weeks that Kevin’s there, I wanted to help out as much as I could. So we’ve packed up about 10 boxes with things that he wouldn’t need (some kitchen stuff, photo albums, sheets, etc.) We got really lucky because we have an unlimited supply of moving boxes from Yamaha (where Kevin works), hence all of our boxes with their logo on the side. Maybe 1/10 of all of our stuff! Yesterday I made four trips to my car to pack up all of the “junk” we wanted to donate to Out of the Closet…it sure felt good to rid ourselves of unnecessary things before our move! Thursday I put in my two week’s notice, so I have only two weeks left of working for the Orange County Girl Scouts! So many co-workers and volunteers who got the news that day told me wonderful, heartfelt good wishes and it was so nice to hear all of those great things. I will definitely miss the people that make up the OC Girl Scouts. Friday I got to work on cleaningcleaningcleaning the apartment! It took two hours to scrub, mop, vacuum and dust the whole apartment, it had been a while since we did a thorough cleaning! Knowing that I only had two weeks left in our wonderful apartment made me get started on the moving process right away to make it as stress-free as possible. On Saturday, Kevin and I got started on the cleaning/sorting process early and spent a whopping six hours going through files, closets, drawers, and cabinets getting things in order and getting rid of so much stuff! It’s amazing how much stuff can accumulate in only three years. We’ve got a major pile started of things that we’re going to donate to Out of the Closet just down the street. Yesterday we had a great day with Kevin’s family…we had a delicious waffle breakfast at his parent’s house and then spent the day at Central Park in Huntington Beach for Judith’s birthday (Kevin’s sister). I will definitely miss the family get togethers, it’ll be hard not being able to be a part of all of them anymore. Our niece Sophie (Thomas’ daughter), she had us cracking up the whole day! So today begins the countdown of days left working at the Girl Scouts…8 to be exact! 🙂 I’ve got a lot to do before I leave, to ensure that my co-workers and my volunteers are prepared to take over for when I leave, but I’m up for the task! So what’s the job that I’m starting on Mon. June 22nd? I’ll be the Admissions & Registrar Coordinator at Alliant International University in San Francisco (the school is right across the street from Pier 39, Fisherman’s Wharf!) I’ll be working with their School of Education, admitting teacher credential students, helping them through the program, and helping connect them to jobs in the local school districts after they complete the program. So it will be a great stepping stone for me as I prepare to become a public school teacher myself in the next few years. I’ll be staying with my lovely sister Jessie for two weeks or so as we look for apartments up there. Kevin will be holding down the fort in Long Beach for a couple of weeks after I leave since we’ve already paid rent through that time. Then on Fri. July 3rd since I have the day off, I’ll be flying back down to Long Beach and we’ll hopefully have our going-away party that evening (save the date!) That weekend we’ll be packing up the moving van and saying goodbye to Long Beach as we make the drive up north to our new home! Hopefully we’ll have found an apartment by that time so we can move our stuff directly to our new apartment. Kevin’s plan is to get a part-time job and go back to school to earn his Aircraft Mechanic License (he’s looking into two programs right now) which I know he’ll do so well in!